From Barker's third and final Syndicated season (and the 8th and last one overall of the 70's Syndicated edition). No CBS Eye like on the Dennis James taping ticket. What's a "Charter Group"? I think it's the show's way of saying "people who arrived on chartered buses" (whatever chartering means). Charter groups booked in advance were guaranteed entry--they used to explain this in the ticket info online long ago. Groups of 20-25 people who book in advanced can receive guaranteed seats and a later arrival time. This is done to ensure a full audience at all tapings. If you have a group this size, please call our Guest Relations Department at 323-575-2448 for further information. This is very cool, I have to laugh at the incorrect use of the word "excepted" on an official ticket. Makes me wonder if it is genuine. This is not necessarily a misspelling of "accepted." I read "excepted" to mean that charter groups are an exception to the rule that people are seated first come, first served. Charter groups are guaranteed seating because they booked in advance. When I searched for this on eBay, I also found a listing for a couple of tickets to a Doug Davidson taping. 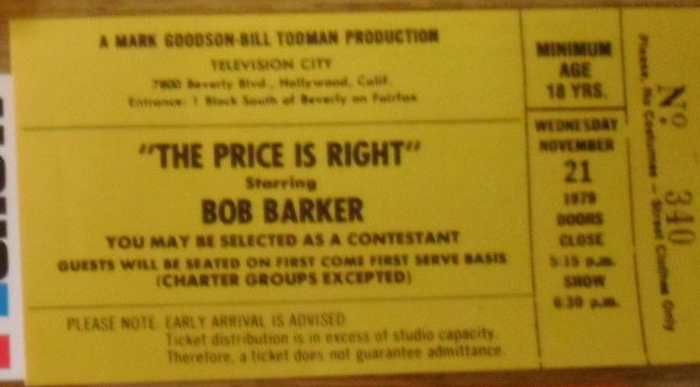 The title on the tickets was "The Price Is Right Nighttime," as opposed to "The New Price Is Right." There's an excellent game show ticket exhibit in the TVPMM vault (courtesy Bob Boden). The May 1978 Price ticket there has a minimum age requirement of 12 years but was increased to 18 years by the date of this ticket on eBay (November 1979). The exhibit also has a pilot show ticket for "The Price Is Right Nightime" starring Mark Kriski from August 1993. Kind of what I was thinking as well -- that while the rules normally apply to first-come, first-serve, charter groups are the exception.